Top tier: Envelope shaped sandwiches. I used a rolling pin to flatten the bread and free hand cut them into rectangle shapes. Stamp for lower letter is Colby with inset fruit leather heart. I made a heart shaped fruit leather seal for the upper envelope. To the left I added pretzels. Heart shaped cantaloupe and seedless green grapes kebabs. This is so fun! I love your love letter sandwich! Such a sweet post! 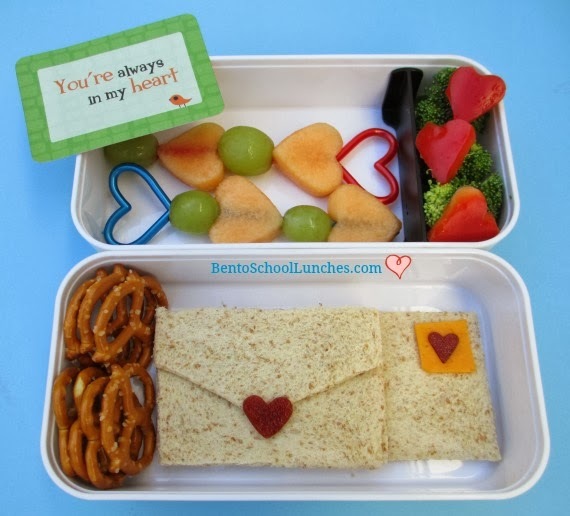 Love the envelope shaped sandwiches!